If you love camping, are planning to go to a music festival or even just want somewhere for the kids to play in the back yard, then you’ll have seen the variety of tents on offer. The best 4 person tent will provide plenty of space for you and all the gear that you have brought with you, as well as being easy to put up in the first place- allowing you to focus on enjoying your time. In this article we will take a look at the important things to consider when buying a four person tent, and our 4 person tent reviews to help you decide which one is right for you. What is a Four Person Tent? If you are looking for a convenient tent for camping, then a 4 berth version could be a good choice. They will be just one room, without the porch or separation that you get with larger tents, but will fold into a compact space, so are easy to transport, and don’t take up a huge area on the campsite. The floor will be large enough for four people to sleep next to each other, but it may prove to be a bit cramped if you use it like this. They provide an ideal amount of space for two adults or an adult and two children, though, and you’ll be able to store your equipment as well. Tents come in a wide range of sizes from single person to 8-person versions, so it’s important that you get the right size to suit your needs. It can be counter-productive getting one that is too large for your needs, because this will involve transporting a heavier, bulkier product that is more difficult to put up, and will cost more in fees at the campground. Similarly, using a tent that is too small for your needs will result in everyone feeling cramped. While manufacturers follow certain guidelines for describing how many people a tent is suitable for, this doesn’t necessarily give an accurate picture. Four person tents, for example, will supposedly have enough space on the floor for four people to sleep next to each other. This doesn’t take into account the need for living space, privacy, and storage space. ​As a general guide, the best 4 person tent will be the ideal size for two adults to live in. There will be plenty of room to comfortably sleep, get dressed in privacy and keep all of your belongings close-by. If you’re taking your kids with you, it would be worth getting a larger tent, preferably with a separate compartment, so they can have room for their own privacy too. Where will You Be Using Your Tent? The environment you plan on using your tent in will have an impact on what materials you will want it to be made from, and any particular features that are necessary. Different tents are designed to manage differing conditions. In hot weather, for example, a tent that is made from lightweight materials and has plenty of ventilation will be vital so the constant airflow will keep you cool. If you will be facing tougher conditions, though, like rain and wind, you will need a tent that is stronger and made from materials to effectively keep the water out. How Easy is the Tent to Use? When you’re away on holiday you don’t want to be spending ages trying to put your tent up, because that will take away from your time to enjoy yourself, and often can be stressful- especially if you’re doing it in the rain. The ease of setting it up is therefore essential. A wide variety of materials are used in making tents- each of which have their own benefits and disadvantages. Canvas, for example, is commonly used in construction. It is waterproof and long lasting, but can become really heavy if it absorbs water. Nylon or Polyester, on the other hand, will remain lightweight, but can deteriorate in sunlight, so aren’t as durable. The door is the weakest part of the tent, so you will need to make sure the zips are reliable and, if it rains, there are lips to prevent the water from seeping inside. You will want a flysheet that covers as much space within the tent as possible to keep things dry, and plenty of ventilation to keep the air fresh and at a comfortable temperature. Storage is crucial, with some tents offering hooks and pockets that provide valuable extra space to keep those important things close. 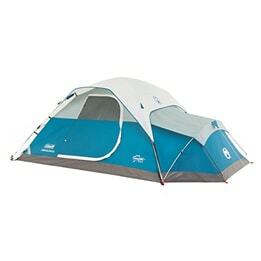 This popular 4 man tent from Sundome is designed to be really easy to use, and would be an ideal choice for you if you are looking for something for short trips. The floor space measures at 9 feet x 7 feet, which is enough for a queen sized airbed, or for four people to sleep next to each other in sleeping bags. 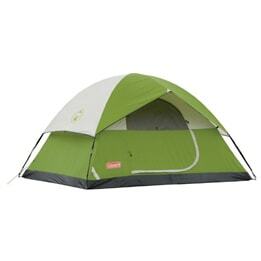 When you’re familiar with this tent you’ll be able to put it up in only 15 minutes. There are also instant tents which take less time to put up. It is a dome shape, and has tough fiberglass poles to ensure it stays firm in windy weather. The dome height is just under five feet so gives a decent amount of room to move about, and there is a rainfly awning outside the door to provide shade in warm weather, and protection from the rain. It has a really useful electrical access port that allows you to run a cable into the tent without having to leave part of the main door open, and there are pockets in the sides to add extra storage space. The WeatherTec system is a nice feature that uses welded floors and inverted seams to keep water out of the tent. If you are looking for an easy tent to use for a small family or group, then this one from Semoo could be a good choice for you. If you have a large family, maybe a larger family tent suits your needs. This tent offers one room in a dome shape, with a hoped fly frame around it to help protect against the rain. The floor provides room for four people to sleep next to each other, but is probably more suited to two or three people if you want a bit more space. It is made from lightweight materials, so is really convenient to transport to your pitching location, and comes with easy to use instructions and poles so it won’t take you too long to setup. Similarly, packing this tent away is also really easy to do, so there’s no end of holiday stress. The tent gives 5.5 feet of headspace, so may not be quite tall enough to stand up in but it’s quite decent for a 4 person tent. The D-style door makes for easy access, and the large mesh windows allow for a constant airflow. 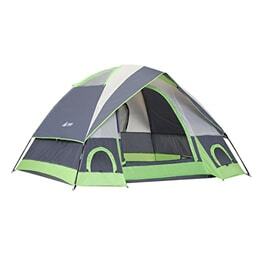 This unusually shaped tent from Coleman is ideal for small groups to travel, especially if you have lots of equipment and don’t want to be spending a long time setting it up. It comes with Coleman’s instant setup feature, which means it will be in place within 60 seconds. The annex of this tent is really useful because it adds extra space for you to store things, or even put a dog bed. The large mesh windows allow for plenty of ventilation, and the WeatherTec system uses welded floors and inverted seams to prevent rain from getting inside. It also has a roof panel, zipper flap and a hood over the door to further keep rain out. This tent also has an electrical port, so you will be able to power all of your gadgets without having to leave part of the main door open. 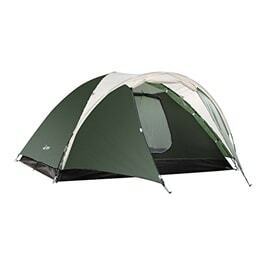 The materials used in construction means that this tent is designed for use from season to season, and purchase of the product will include a carry case and all of the pegs you need. The total weight is just over 13 pounds so you will be able to easily bring this with you wherever you go. If you want a low cost option that will provide everything you need to get some privacy on a campsite or in the wilderness, then this tent from Semoo is a worthy contender. It will sleep up to 4 people, but is more suited to two or three, with some extra space for storage. The frame is made from a high strength fiberglass to ensure it stays standing in tough weather conditions, and is really easy to set up with the inbuilt pole pockets. The mesh windows and special material used to make the inner lining means that airflow is continuous inside, leaving you feeling fresh no matter the weather. The outer lining is made from polyester to keep you dry, and the design means that water rolls away from the entrance so you won’t worry every time you open the D-shaped door in the rain. The center of the dome provides just a little over 4 feet of headroom so isn’t tall enough to stand, but still gives you room to move around. The full tent only weighs 7.26 pounds, so won’t be a problem to transport to a campsite, or carry on a hike until you reach the place you want to stay. This tent from ChezMax is suited to all seasons, and comes with a bunch of features to ensure you will remain comfortable no matter the weather. The floor gives you 6.9 feet x 3.3 feet of space, which is enough for three people sleeping with some room for storage. It’s really easy to setup with its umbrella design, and just as easy to pack away after use. A really nice feature of this tent is that the inner part can be removed to be used as a sun shelter in its own right, and there are storage pockets and hang loops so you’ll be able to put your gear safely out of the way. The floor is a bathtub design to stop water getting in, and the two skylights make sure the tent is well ventilated without letting water through. There’s a mesh layer on the door to allow more ventilation without the bugs getting in and, with a door on either side, you’ll be able to exit in whichever way is the most convenient. 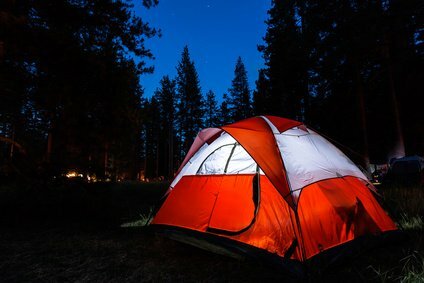 If you and a small group of people are going to a campsite, outdoor area, or even your back yard, then a tent is the ideal product to provide you with protection from the elements and a level of privacy. The best 4 person tent is designed for just this reason, and will easily sleep up to three people in plenty of comfort.